The Maple Leafs went into a crucial two game series against the Canadiens, in Montreal, in late March, trailing the Habs by three points for one of the final playoff spots in the Eastern Conference. The Ghost of Ed Belfour had season ending surgery, giving the task of leading the Leafs to a young Mikael Tellqvist, who Leafs fans were pining to take starts from Belfour earlier in the year. Tellqvist folded badly under the pressure, allowing 11 goals over the two games and ending all realistic hopes of the playoffs. Tellqvist didn't play another game for the Leafs, instead relinquishing the temporary starting job to J.S. Aubin, who led the team to an improbable 9-1-2 stretch to end the season. The Leafs still missed the playoffs by two points, but started the classic tradition of pouring it on late in the season when the chances of playoffs are next to none, dooming many fans to get sucked right back in. The Leafs never win in Buffalo. Never. Even when the team was good. That's why it was so surprising when the Leafs held a 2-0 lead against a really good Sabres team on October 15, 2007. The Leafs held that lead until mid-way through the third period, when Buffalo scored twice in 37 seconds. Things like this happened to the Leafs all the time, and they usually responded by letting the game get away quickly, but this night the Leafs fought hard and traded goals with the Sabres before the final buzzer sounded, sending the 4-4 game to overtime. In overtime, Pavel Kubina took a tripping penalty with less than two minutes to play, giving the Sabres a 4-on-3 advantage. With five seconds left the Sabres hammer it on goal and Bryan McCabe inadvertently swats the puck right into the net while attempting to clear it from danger. McCabe was a whipping boy for most of Leafs Nation at that point, and this play justified everyone's hatred and essentially paved his way out of town. Random stat that tells it all: Johnny Pohl and Chad Kilger combined for 6 points on the night for Toronto. Sure these types of crazy bounces can happen to any goalie, but it's painfully representative of the type of goaltending the Leafs have received since the lockout. When your team's goaltending can be summed up with something forever banished to blooper reels, you're probably not winning many games. In 2007, the Leafs beat the Canadiens in the last game of the season to give themselves a chance to make the playoffs. The only catch was that the Devils needed to beat the Islanders the next day. "Hey, the Islanders, when was the last time they won a game of relevance," said Leafs fans everywhere. Better yet, the Islanders needed to start journeyman Wade Dubielewicz. Piece of cake for the Devils, right? The Islanders took the game 3-2 in a shootout and Dubielewicz slammed the door on Sergei Brylin to end the Leafs season in a game they didn't even play. Anytime your season comes down to a game played by the Islanders, you know something has gone horribly, horribly wrong. Heading into the last day of the regular season the Leafs were two points out of a lottery spot behind Phoenix and Los Angeles. Toronto held the tie-breaker, meaning as long as the Leafs lost and the Coyotes and Kings won, the Leafs would have their first lottery pick since drafting Scott Thornton in 1989. Phoenix beat Anaheim 5-4 in a shootout and Los Angeles beat San Jose 4-3. Two garbage teams beat two vastly superior teams. For once everything broke right for the Leafs, at least in a twisted loser way. Everything, that is, except for Boyd Devereaux. In the final game of the season, the Leafs took on the Senators, and soundly defeated them 5-2 on the strength of a Devereaux hat-trick. A man who ended his career with 67 goals (oh God, really?) decided the best time to score his only career NHL hat-trick was in the one game Leafs fans wanted desperately to lose. Instead of ending up with the 5th overall pick, the Leafs settled for the 7th, drafting Nazem Kadri and missing out on Brayden Schenn, who went to the Kings, 5th overall. You could see the smoke visibly steaming out of Brian Burke's ears when LA called Schenn's name, as he was, and still is, the exact type of player the Leafs needed: a big, strong centre. Thank Boyd Devereaux for the drought up the middle. Even when the Leafs win they managed to screw it up. Oct. 5, 2005, the first game back from the interminable lockout, and the Leafs and Senators head to a shootout to settle the opening matchup of the Battle of Ontario. The only video evidence of the league's first ever shootout is scant (unless you want to see Ottawa's goals, but I want to see Toronto's futility), and very poor in quality, which is a shame, because Jason Allison registers one of the worst shootout moves in league history. Allison's move basically consisted of skating as slow as humanly possible while banging his stick once behind the puck before shooting it right into Dominik Hasek's pads. It was the type of move that hasn't worked for anyone, ever, not even in street hockey. It was the type of move that made Leafs fans look at each other and say, "uh oh, is this how this season is going to go?" Not only was that how the season was going to go, but it was how it was going to go every single season. Allison's pitiful attempt at a shootout was a dark harbinger for things to come. The Leafs have a 28-39 record in the shootout since its inception and have never finished a season over .500 in the skills competition. Jason Allison cursed the team with that shootout move. My recollection of this is fairly hazy because it was after a Saturday night Hockey Night in Canada telecast and I may have drank my fair share of alcoholic beverages to get through another Leafs loss. But I've done some sleuthing and discovered it was after a 3-2 loss to the San Jose Sharks that dropped the Leafs to 2-9-2 in their previous 13 games. A classic Toronto death spiral. In the post-game interview, Maurice nearly broke down. You can see the sadness all over Maurice after he's asked a question regarding whether the team has quit on him. Maurice lay it all on the line and defended his team, yet it was clear he was overmatched, and didn't have anywhere near the requisite assets to win. But he cared, dammit. The losing was really affecting the man. At the house I was at everyone just stood around the TV and watched in silence. It was shocking to see such naked emotion on Maurice's face. It was sad, yet at the same time admirable. Maurice was fired after the season, but his failure wasn't for a lack of heart. He cared. Once it began painfully clear that the Leafs needed to rebuild, even to upper management, JFJ was finally taken out behind the barn to put out of his misery. Cliff Fletcher came in and vowed to clean house and clear the decks for the next GM, who was going to be Brian Burke except that was a major secret that wasn't really a secret. Fletcher's task was going to be somehow moving Mats Sundin, Bryan McCabe, Pavel Kubina, Darcy Tucker, and Tomas Kaberle at the deadline. The problem was that all had no movement or no trade clauses, so it was no done deal. The key in the whole scenario was Mats. What the captain did would likely lead the other four to do the same. After weeks and weeks of speculation and media hounding, Mats declared he wasn't going to waive his NTC, and it became clear that neither would the other four. Apparently this was decided at one of the player's cottage in Muskoka, dubbing the players "the Muskoka Five". The decision set the Leafs back years. Mats left in the summer for nothing, Darcy Tucker was bought out, Pavel Kubina and Bryan McCabe were miraculously dealt in nothing more than salary dumps, and Tomas Kaberle stuck around for a number of years until finally being dealt by Brian Burke to the Boston Bruins. Many Leafs fans were mad at Sundin—although I want the record to show I was not one of them—but all was eventually forgiven when Mats came back the next season as a member of the Vancouver Canucks and got a standing ovation, which caused him to tear up on the bench. 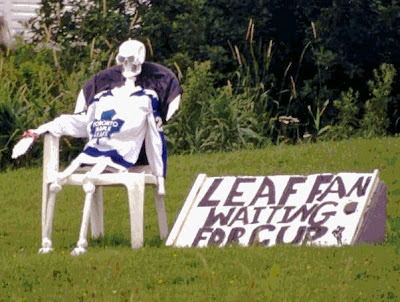 The moral of the story: if you truly love the Leafs you're always doomed to cry. Oh man, this is a great, but also extremely sad article. I was at the Mats Sundin return game and I'm proud to say I was one of the few that booed. If he really wanted to help the leafs he would have agreed to be traded. I'm also cheering for 12 more losses to close the season. We need a lottery pick! You proudly booed Mats Sundin? I'm sad you're a part of Leafs Nation. Yupp, cause trading Mats to the habs for Grabovski, Huggins and a 2nd would really have turned this team around.. It'd too bad we have none of them now. Oh wait. Give your head a shake. 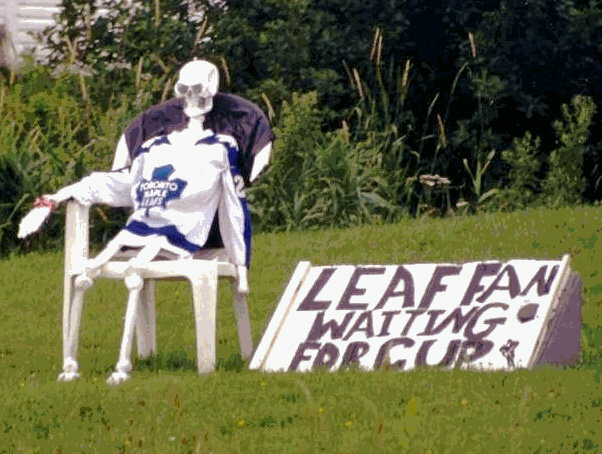 You aren't a member of Leafs nation. TIL why the Muskoka five is called the Muskoka five. The McCabe trade upset me. That same day Wade Belak was also moved.